There is one top buckle Strap with the Bal-Laced instep. The boot shaft is lined with tan cowhide leather to keep its shape, and the foot and ankle area is lined with Elk-tanned glove leather for extra comfort. A double thickness nitrene sole for long wear and easy replacement. The Bal-Laced instep allows for greater flexibility in the instep fitting. 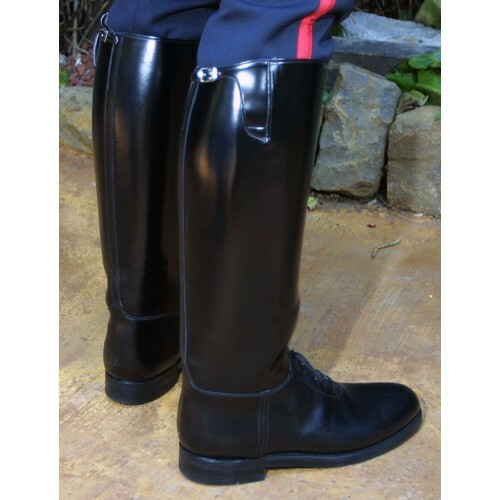 The Dehner "Dress" Patrol, lacking the instep laces, has a bit less latitude in the fit around the instep. The lacing on the Bal-Laced provides some flexibility for people with a larger than average instep. Dehner Bal-Lacing is designed to have the lace tie in the middle of the instep for the greatest flexibility. Size 15 and above call the store for information. Please note on our order size-grid (click to view) there is the option to order ONE-INCH WIDER CALF in the "D" width foot and ONE-INCH WIDER CALF in the "E" width foot. 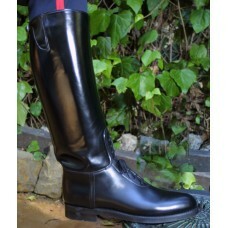 (Designated with + 1" in the selection menu) This wider calf option adds one-inch to the circumference of the calf area.